She immediately put her paws around them — and even started nursing them. 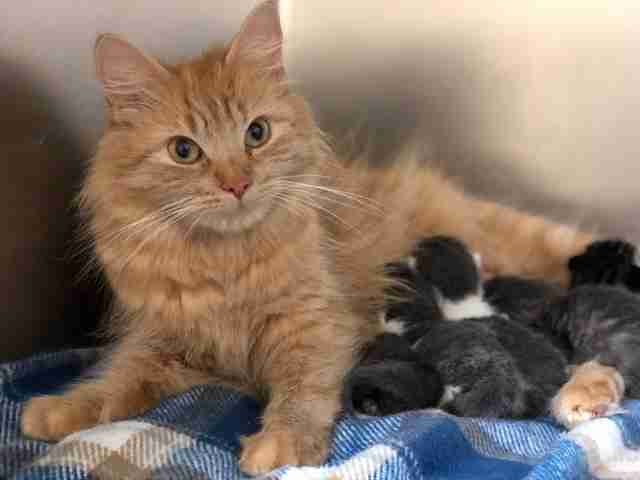 After a cat named Church gave birth to a litter of five kittens, something went very wrong. 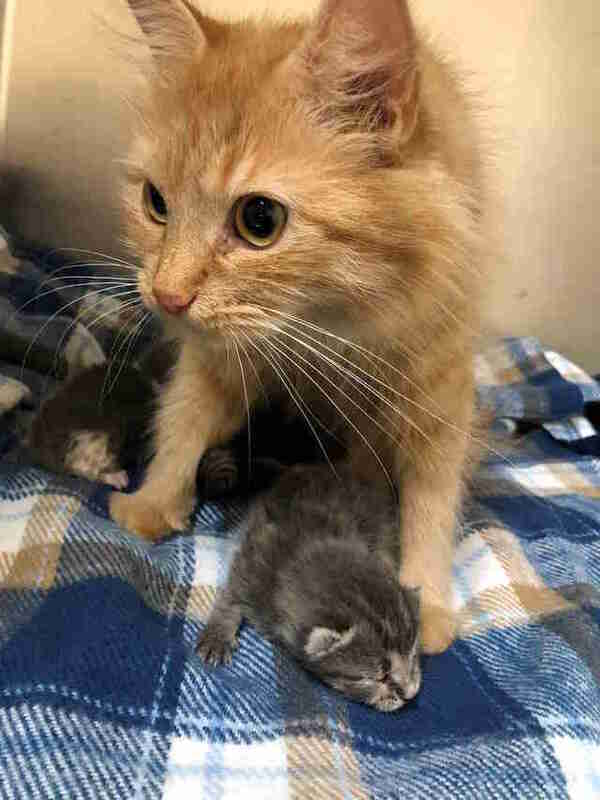 The tiny kittens needed their mom’s love and care more than anything in those first few moments on Earth, but Church was suffering from a prolapsed uterus, putting her in critical condition. 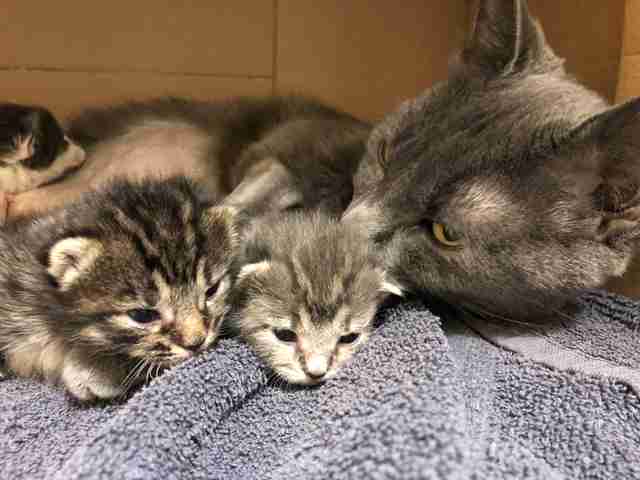 She needed to be rushed to the hospital, so Church's owner contacted the people at the MSPCA-Angell shelter to see if they could help her kittens. Luckily, a 2-year-old orange tabby cat named Betty happened to be there in the shelter, waiting for a home. And she was more than happy to help. When Betty first met the kittens, she immediately started cleaning their sleek gray fur and putting her orange paws protectively around them. 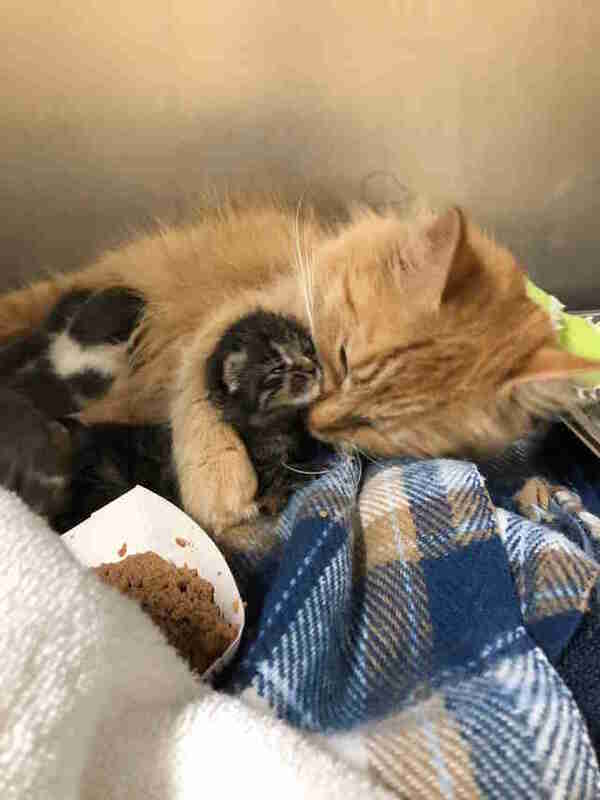 "She spent the next two days caring for all five kittens until Church was back on her feet and able to be with her kittens again,” Krieger said. When Church was strong enough, she was reunited with her kittens. But after what she’d been through, she wasn’t producing enough milk for so many tiny hungry mouths. So Betty kept nursing three of the kittens to help out Church. “Neither cat was producing quite enough milk for all five kittens but we were very happy to see that each could support half of the litter. This was truly an it-takes-a-village moment,” Krieger said. Betty and one of the kittens were transferred to a foster home, while Church went home to her family with the other four kittens. Once the kittens are 10 weeks old, they’ll be up for adoption. 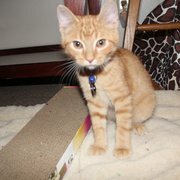 And after the last kitten is weaned from Betty, the cat who is being called a hero will still need a home. If you think you can give Betty the home this hero cat so deserves, you can email adoption@mspca.org for more information. You can also make a donation to the MSPCA to help all the homeless cats it saves.